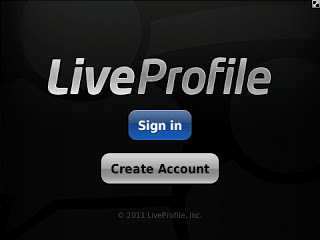 Like BlackBerry users, Android users can now ping with the help of an application known as ‘Live Profile’. 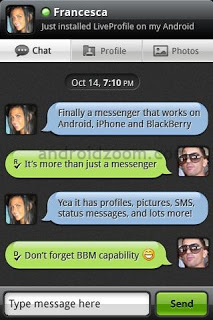 Although this application has been in existence for a longtime, it has now been improved and imbedded with BBM capabilities. Check: BBM Now Available on Android and BBM. You will be given a unique pin you can exchange with friends and family. LiveProfile offers a cheaper, faster and more reliable alternative to text messaging allowing users to communicate with lightning-fast message delivery and confidence, indicating when messages are delivered, read, and even when the recipient is typing a response, making it feel closer to a live conversation. And, where text messaging charges can quickly rack up, LiveProfile is free—even for international use—making it easier on the wallet, too. Go to the Android Market (Google Store Play), Type or Search for “LiveProfile” and Hit the Install Button OR Visit www.LiveProfile.com. Share your experience with this application via the comment section below.